About B. E. Publishing Inc.
Here’s a local economic roadmap for anyone trying to navigate one of the most dynamic business regions in the world. Students looking for their first job, young professionals thinking of making a switch, or executives seeking a broader understanding of what makes the Boston economy tick will find valuable insights and data. The Boston Economy provides overviews of the local economy’s major sectors, including startups, health care, financial services, higher education, and professional services. 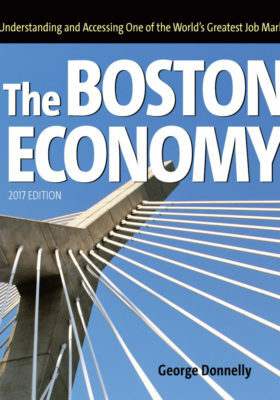 It also delves into key policy challenges and offers tips for newcomers looking for a foothold in the Boston economy. The Boston Economy is available for $34.95 per paperback. Order 5 or more copies to receive the bulk rate of $31.95 per book. Taxes and shipping included! Head here to order your copies now. Contact George Donnelly at gdonnelly@bostoneconomy.com with any questions. George Donnelly has been covering Boston as a journalist for 30 years. He was the editor of the Boston Business Journal from 2000 to 2014, and teaches a course on the Boston economy at Suffolk University. © 2016 Boston Economy Publishing Inc.